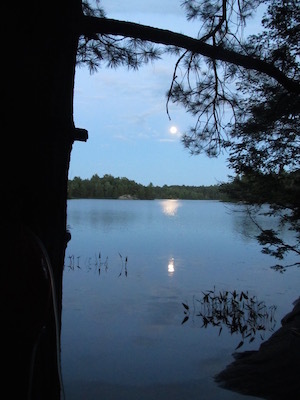 I spent last week paddling in the wilds of Souther Ontario. 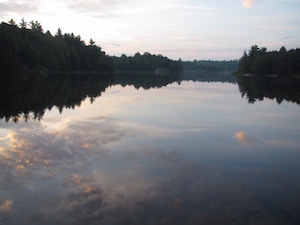 My days were filled with the changing moods of the waters of the backcountry lake, often calm in the morning shifting to white capped by the afternoon and returning to a mirror like stillness just before sunset. 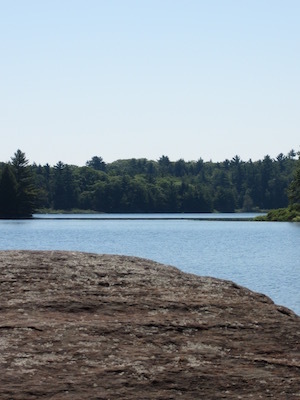 The smooth rock outcropping at the edge of our campsite stayed warm from morning to night creating an inviting place to dive into the water or lie down for a rest after a swim its curves perfectly fitting my body as I was dried by the gentle breeze. The moon grew fuller each night casting a bright light on our tent. Taking a week to commune with the water and the trees and the sky and myself, changes me. Being touched by nature is so nourishing. If you’re feeling sluggish it awakens your senses and brings you back to life. If you’re feeling down, it uplifts you. If you’re feeling scattered being in nature focuses you on the present moment. There are so many ways to connect with the healing power of nature. Some of them are right outside your front door. Open your window and invite the breeze to caress your skin. Stand in the sunlight and feel it’s warmth. Listen to the birds first thing in the morning and let their song delight you. Gaze at the moon and find comfort in its presence. Lie down in your back yard and feel the earth supporting you. Hang your sheets on the line and later luxuriate in their aroma. Walk around your neighborhood at night and discover the cover of darkness. Stand under your umbrella and greet the rain with an outstretched hand. Or sit on your front porch in a rainstorm and enjoy the show! Nature is always there waiting for your arrival. Next time you are not quite feeling like yourself, go outside and let nature work its magic. This entry was posted in beauty, nature. Bookmark the permalink. Both comments and trackbacks are currently closed. Bees humming busily in my large, blue, Russian Sage. It is a meditation to watch them and to hear their happy buzz. Later, I harvested those azure spires, along with sunflowers, amaranth, and artimesia and created two tall, airy bouquets to grace my home. Yes,summer is luxurious, and your words certainly capture this. Rachael, you’ve reminded me of the sunflowers I used to grow and the pleasure of seeing the little bees late summer, all snuggled in the yummy pollen in the centre!